Barbara Hawthorn created a sultry evening setting complete with a fire element offering warmth and light. The Washington Design Center is celebrating the arrival of spring with a series of lectures plus special promotions on the latest outdoor collections during Outdoor Week, taking place now through March 4th. On February 28th, a panel of experts discussed the latest landscaping trends and offered advice on how homeowners can create al fresco spaces that complement the overall style and architecture of their homes. Landscape architects Anthony Cusat of McHale Landscape Design, Elizabeth Norman of Elizabeth Norman Landscaping and Jay Graham of Graham Landscape Architecture, as well as interior designers Barbara Hawthorn and Dana Tydings, shared insights and advice about how homeowners can get the most out of their landscape plans in a practical and realistic way. What is the best way to formulate a plan for furnishing my outdoor spaces? Elizabeth Norman: The first thing to do is to determine how you live in and use the space. On a recent job, my client was trying to do everything—read, relax, play and entertain—in a small space. We took all the furniture out and didn’t put it back unless it solved a problem. What are some of the challenges homeowners face when embarking on an outdoor project? Barbara Hawthorn: I ask clients, “How do you envision using this space? How many months will you really use it?” One of the challenges is making a space attractive during its fallow time, designing for all seasons. I tell clients to have the philosophy that “it is going to grow with me.” The fact that it is going to take time [for a landscape to mature] is one of the hardest things to convey. 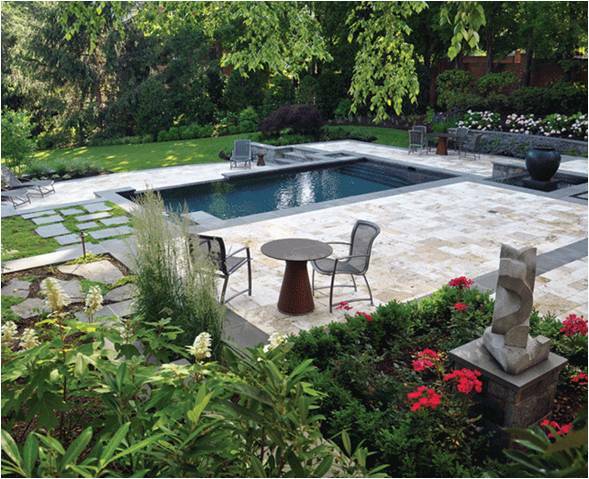 Poolscape by McHale Landscape Design uses Turkish travertine, which stays cool in the summer heat. How can you extend the seasons in an outdoor space? Anthony Cusat: We can add shade in the summer and heat in the winter. You can also build a pool house or a pavilion with a heater. One material we are using a lot is Turkish travertine; itís very comfortable to walk on and doesnít get hot in the summer. How can I be sure that my interior style will marry with my outdoor furnishings plan? Dana Tydings: In a perfect world, you would meet with your landscape designer and your interior designer at the same time. People don’t realize that if they are working together, they can save you time and money. What is the difference between a garden and a landscape? Jay Graham: A garden is very dynamic. It changes constantly and you engage with it. A landscape is an established setting for your house. Elizabeth Norman: A landscape flows into a bigger vernacular, into the surrounding geography. A garden sits within the landscape. It quakes and moves all the time. It changes color daily in small ways and in big ways four times a year. What should I look for in an outdoor fabric? Barbara Hawthorn: There are so many new fabrics now. They are incredibly easy to clean and don’t limit your versatility. The new solution-dyed acrylics are resistant to sunlight, rain, and discoloration from falling leaves. How can I stick to a budget and use the latest designer fabrics? Dana Tydings: The newest outdoor fabrics are not inexpensive. At $60 to $80 a yard, you should order them sparingly. Do it in stages and do it right. Barbara Hawthorn: Be sure to include welting in the seams to be sure cushions are durable. Elizabeth Norman: You can jazz up affordable fabrics in solids and stripes with pillows in more expensive patterns. I like to change pillows seasonally. What types of elements should an effective landscape include? Jay Graham: Thinking about how the landscape itself is “furnished” is important. I like to design low walls in a landscape that can be used used for sitting, dining and putting drinks on even when the furniture is put away. How can lighting enhance my landscape design? Anthony Cusat: Low-voltage lights create a nice, warm glow. The new LED lights have warmer tones now. It’s very beautiful to up-light trees, such as crape myrtles, from below. Or you can add moonlighting by installing LED lights in the trees, shining down. What are some trends in outdoor living spaces? Anthony Cusat: We build a lot of outdoor kitchens with grills, sinks, refrigerators and beverage centers as well as wine-tasting gardens that connect to a pool house. 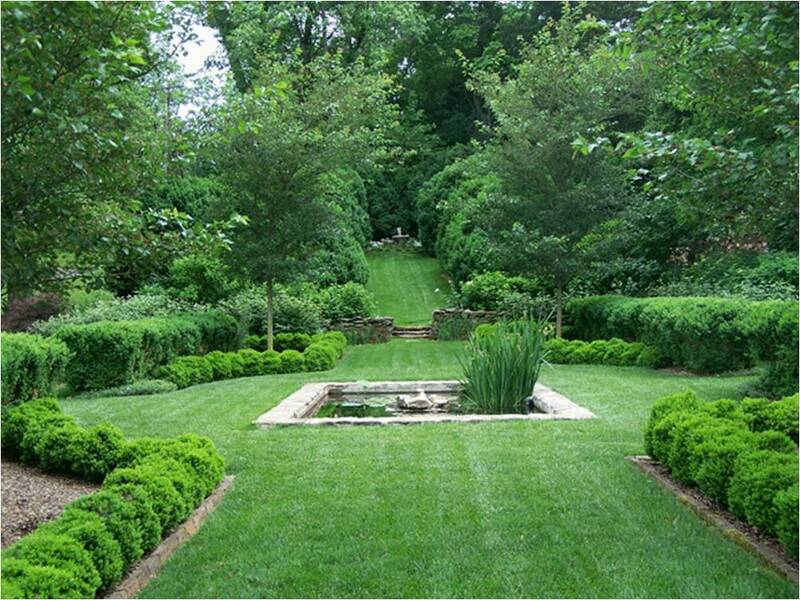 An environmentally-friendly garden by landscape architect Elizabeth Norman. How can I create an eco-friendly garden? Elizabeth Norman: It used to be really hard to have an organic garden. Now, Lowe’s organic department is as big as its conventional one. Ask professionals for plants that don’t need poisons to look good. And remember that some organic products are just as poisonous as their conventional counterparts.